Welcome to Top 5’s where your host decides what their top 5 picks are. You might agree with them, you might disagree with them, but the fact of the matter is you’re watching them. Tune in every Wednesday starting in June for a new episode. Ridden the Bataleon Party Wave? Arbor Clovis is still twin? 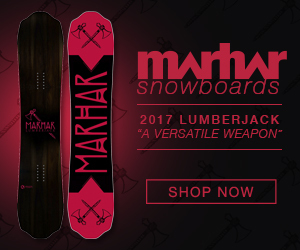 Would you consider it a all-round freerider or more pow day specific board? Freerider that can slay pow. I need to stop watching you reviews. I just keep adding to my list of possible new boards. I was just trying to decide between the Rome Ravine, Capita Navigator and the Lago Open Road. Now add in the K2 Overboard. Your reviews and top 5 are great. There are just too many good boards now. Take a mortgage out, buy them all, go into debt, live in a van down by the chairlift, snowboard everyday. You been on the bataleon party wave? Thoughts? I love your reviews and pretty much agree on most of them. Have you considered trying out the Head “The Day” Board? I just got my fist day on a 156 and must say it’s a pretty nice ride. I would say it is kind of a mix of the Salomon Derby and the Jones Hovercraft. I found the 151 Derby a bit too short for my riding, and the Head was pretty fun. Thanks for your reviews and please keep em coming! Heads on the list to ride, but man are they impossible to deal with.